Large cities are engaged in reducing CO2 emissions with the help of renewable energy. 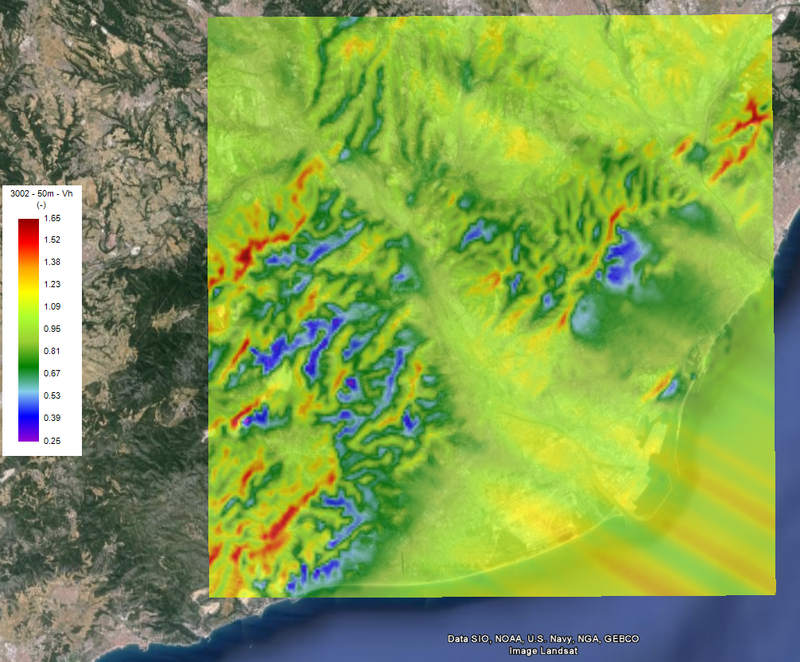 The aim of this study is to assess wind resource and energy production over the 640 km² of the Metropolitan Area of Barcelona (AMB) in order to set up small wind turbines to be connected to the smart grid. Buildings will create wind acceleration, recirculation areas, blocking effects. 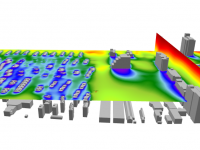 CFD software UrbaWind models the wind inside this complex urban canopy. The selected wind reference is from a weather mast located near the shore at Sirena (41°20’28.29″N, 2° 9’57.99″E, H = 10, Port of Barcelona). The wind speed histogram and wind rose observed at the station are included hereunder. Orography data is extracted from the NASA database (SRTM). Roughness is computed from Corine Land Cover database (2006). 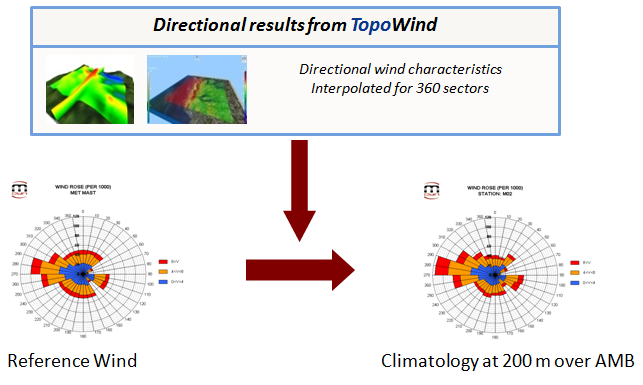 TopoWind performs the transfer of the wind characteristics from the wind reference to the 200 meters high area above the AMB. With a horizontal resolution of 25 m, the mesh size is about 20 Million cells for a computational time of 5 hours per direction. The directional resolution is 20 degrees, leading to 18 directions. As an example of these computations, a mapping of the resulting wind speed coefficients for one synoptic wind direction is shown in figure below. The wind speed coefficient is defined as the horizontal mean speed divided by a wind at 10 m height. 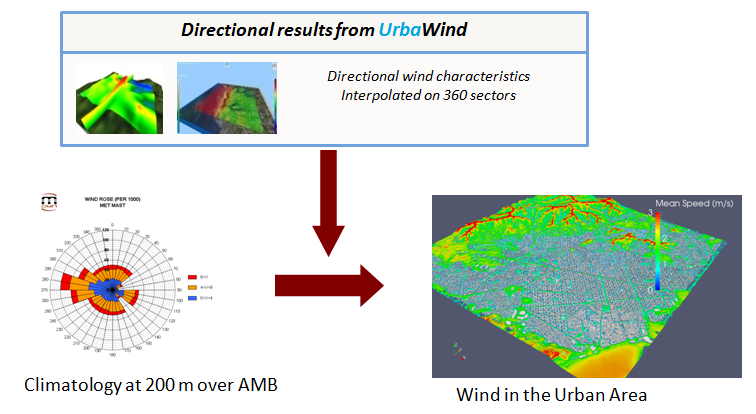 The obtained wind characteristics over the AMB were used as the input in the subsequent micro-scale downscaling carried out to include the urban local effects. 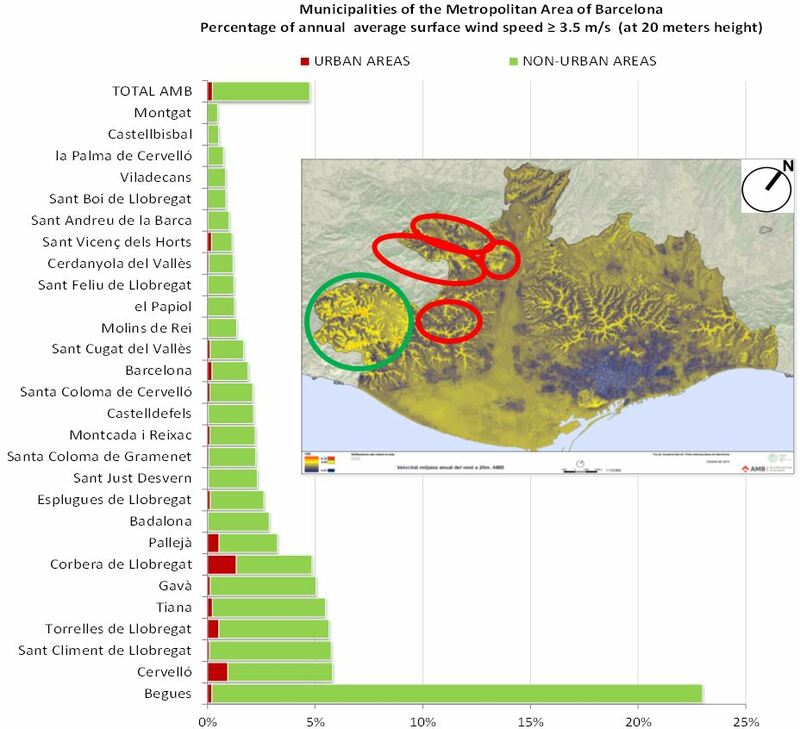 Barcelona Regional, an urban development agency provides the entire numerical model of the 640 km² AMB’s urban area. The whole area has been split in small parts with overlapping pats in order to suit the wind model requirements. It includes CAD of the building and orography. For the buildings, Barcelona Regional developed some scripts for GIS and RHINO-Grasshopper in order to get 3D building geometry joining 0.5 meters resolution LiDAR data with Cadastre data. For the terrain it has been used an original 2 meters orography data resolution. The CAD of the building includes roof superstructures such as chimneys and shed dormers. The mesh resolution is about 1.0 m around the buildings. Considering 8 directional computations, the total computational time is about 1104 days. Three computers with 8 processors 2.4 GHZ Intel Xeon each helps to reduce the computation time to 3 months. A cross-validation of the numerical results is performed thanks to seven weather stations located in the AMB. The difference between measured and computed wind speeds remains under 0.4 m/s except for the station of Vallirana where the mast is located near some vegetation. Higher computed results can be explained because of the non-existence of the vegetation in the simulation, which leads to an over-estimation of wind speed. • There are very few locations with the minimum mean annual wind speed of 3.5 m/s for starting energy production at 10 m height. • Only at 20 m height we start to find acceptable areas for small wind turbine energy production. These areas represents about 5% of the total surface of the AMB. The 95% belongs to non-urban areas, whereas the 5% are located inside urban areas. This low percentage for urban areas are due in part of the elevated urban compactness of the majority of municipalities in the AMB and also because the wind areas are located mainly in mountain ranges. • For higher hub heights, i.e. starting from 30 m height, the territorial percentage of exceeding the minimum velocity criteria is increasing. • Begues is the windiest municipality at 20 m height with the 23% of the territory (mainly in non-urban area) that could fit wind conditions for small wind turbines at 20 m height. The other municipalities only reach between 5% and 0.5%. 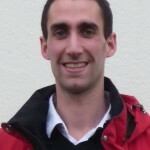 • If we only take in account urban areas, the better municipalities for small urban wind turbine are: Corbera de Llobregat, Cervelló, Pallejà, and Torrelles de Llobregat.